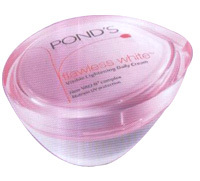 Pond's offers you the magic of the Pond's Flawless White effect that works to visibly lighten skin and reduce dark spots and blemishes in just 7 days. It contains the breakthrough VAO-B3 complex, the new Vitamin E, Allantoin and Optics powered Niacinamide complex that works hard on dark spots to help deliver flawlessly radiant skin. For women across Asia, the appearance of blemishes or dark spots on the skin’s surface (also known as hyper- pigmentation) is a barrier to beautiful skin through extensive research conducted by the scientists at the Pond’s institute, for various countries including India, we were able to discern that the ideal expression of a woman’s beauty is not pale white skin, but flawless white- fair, clear skin, that is free of all blemishes. Protects against the sun’s UVA/UVB rays. Use every morning after cleansing your skin. 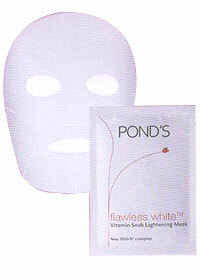 Smooth cream over entire face and neck with your fingertips. For best results use every morning & evening after cleansing your skin. click on image Enriched with new VAO-B3 complex and multiple UV sunscreens, this moisturizing day lotion knows where your skin needs extra help. Its proven active system works harder on the dark spots and blemishes that need more lightening, reducing discoloration and evening out skin tone.